The aim of the present paper is to assess whether mergers and acquisitions (M&A) create value. For this purpose, a sample of 30 largest M&A deals in the UK is investigated. The sample covers the period of 2013-2015 which allows for examining both short-term and long-term performance as well as minimise the potential impact of the global financial crisis. The cumulative abnormal returns (CARs) and buy-and-hold abnormal returns (BHARs) are employed to estimate the performance of the acquirers. The analysis relies on testing the deviations of abnormal returns from zero by performing several cross-sectional tests for different event windows and holding periods. The findings provide no evidence for the impact of M&A on firms’ short-term performance. More specifically, CARs are found to be statistically indistinguishable from zero for several symmetric and asymmetric event windows with lengths of 3, 11, and 21 days. Similar results are obtained for BHARs with shorter holding periods. However, the negative abnormal returns for the 24-month holding period are found to be significant. The findings are consistent with the general perspective on M&As not creating value as well as similar empirical studies. Mergers and acquisitions (M&A) have received great attention from scholars and managers. The M&A activity is crucial for firm growth as the realisation of potential synergies would allow for pursuing otherwise inaccessible investments. While enhancing shareholder value is regarded as the main incentive for undertaking acquisitions, the observed post-merger performance provides mixed support for the value-creating role of M&A. This suggests that it could be important to further investigate the impact of M&A on firm value. The complexity of the M&A activities has been noted (Cartwright and Schoenberg, 2006). It has attracted the interest of different disciplines which focus on financial, behavioural, cultural, and strategic aspects of acquisitions. This suggests that the investigation of the value-creating potential of M&A in the context of a variety of theoretical frameworks can be useful for improving the understanding of successful M&A. In particular, behavioural perspective should not be neglected as it might explain existing market inefficiencies as well as managers’ incentives for undertaking M&A. To assess the effect of M&A announcements in the UK on the abnormal returns of the acquiring firms in the short-term. To assess the post-acquisition performance of UK acquirers in the long-term. The paper contributes to the existing academic literature in several ways. Firstly, the study focuses on recent M&A deals which ensures its relevance. The choice of the examined period allows for examining long-term stock performance while minimising the potential impact of the global financial crisis. Next, the paper investigates both the immediate impact of the M&A announcement as well as the value creation for longer holding periods. This allows for comparing the short-term and long-term effects within the sample. Finally, the analysis employs several statistical tests and different event windows and estimation periods which allows for assessing the robustness and validity of the findings. The paper has the following structure. Section 2 reviews existing theoretical frameworks and established empirical evidence on the value-creating potential of M&A. Section 3 describes the design of the research as well as the data sample and statistical methods employed in the analysis. Section 4 presents the main findings of the paper. Section 5 discusses the results in the context of empirical and theoretical literature. Section 6 concludes the paper and makes recommendations for future research. The existing empirical evidence is mixed (Yaghoubi et al., 2016a; Rahman et al., 2016; Datta et al., 1992). However, the general consensus is that M&A deals are not associated with value creation (Tuch and O'Sullivan, 2007; Haleblian et al., 2009). Short-term announcement effect is commonly reported to be negative or not significant (Trichterborn et al., 2016; King et al., 2004). At the same time, long-term effects are generally significant and negative (Rahman et al., 2016; Yaghoubi et al., 2014; Tuch and O'Sullivan, 2007). The study of Ishii and Xuan (2014) examined 3, 5, and 7-day event windows and found no evidence for non-zero abnormal returns. Similar results were obtained by Golubov et al. (2012) for the US. However, only the 5-day window was examined. Similar findings were reported by Bhagat et al. (2005). A large sample of US acquisitions was employed but the CARs were found to be indistinguishable from zero for the 11-day event window. No effect was also observed by Wang and Whyte (2009) who investigated the [-1, 0] event window to capture potential influence of information leaked prior to the announcement. In contrast, Ahn et al. (2010) found a significant negative impact of announcements on abnormal returns for 2, 3, 5, and 10-day event windows. The results were significant for all window lengths which contradicts the findings of Golubov et al. (2012) for the US. 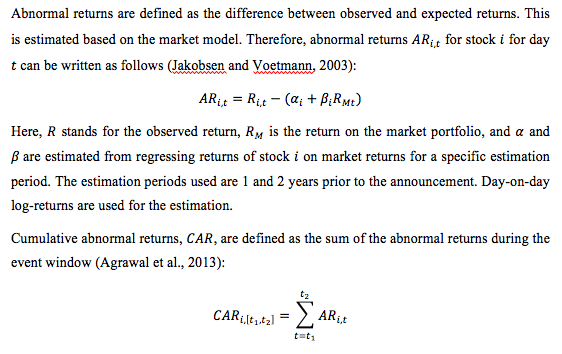 Both studies relied on the market model to estimate the abnormal returns, but Ahn et al. (2010) focused on a narrower period. Significant positive effect was observed by Antonios et al. (2007) who studied M&A in the UK. Bouwman et al. (2007) observed significant negative effect of the US acquisitions on BHARs with the holding period of 24 months. Similar results were obtained by Croci (2007) who studied a smaller sample of EU firms. 24-month BHARs were found to be negative and significantly deviating from zero. At the same time, negative abnormal returns for 12-month and 36-month holding periods were not statistically significant. Negative but insignificant BHARs were similarly observed by Gregory and McCorriston (2005) for a sample of cross-border UK acquisitions. The UK firms were also studied by Conn et al. (2005) but negative BHARs were not found to be significant. In contrast, the findings of Aw and Chatterjee (2004) regarding a smaller sample of UK acquirers showed that 12, 18, and 24-month windows were associated with negative significant CARs. Similar results were obtained by Lamba and Tripathi (2015) and Akbulut (2013). The review of existing theoretical frameworks as well as similar empirical studies suggests that separate hypotheses for the short-term and long-term M&A effects should be formulated. The short-term impact of M&A would be attributed to the market’s expectations on the realisation of synergies (Cuypers et al., 2017). It was established that firm-specific factors as well as personal characteristics of the CEO may influence the M&A decision. As such, the reaction of an efficient market would incorporate all information to determine if the deal is beneficial for the company. The decision-making process can be assumed to focus on the eventual wealth enhancement for shareholders as well as other agents and parties (Deng et al., 2013). This perspective of maximising the stakeholder value implies that an acquisition announcement would be followed by a positive response from the market, as the deal would be regarded as value-creating. Consequently, positive abnormal returns should be observed around the announcement date. The presence of market inefficiencies might also encourage managers to seek mispriced firms (Kyriazopoulos and Drymbetas, 2015). Acquiring undervalued companies would also result in a positive market response. The resource dependency theory (Pfeffer, 1972) is consistent with this line of view as financially constrained targets would be able to pursue otherwise inaccessible growth opportunities which can be exploited by the acquirer. Hypothesis H­1: There is a significant positive effect of acquisition announcement on abnormal returns of the acquiring firm in the short term. The resource dependency theory and stakeholder value maximisation perspective can also be applied to the problem of long-term value creation (Pfeffer, 1972). Both frameworks argue that acquisitions would be beneficial for the shareholders. This implies positive abnormal returns for the acquirer in the long run. At the same time, several theories propose that no significant effect should be observable. This includes frameworks assuming that the market is inefficient. In particular, the perspective of behavioural finance suggests that cognitive biases could lead to the market over or underreacting to the initial acquisition announcement. Future corrections could result in poorer market performance, effectively eroding the initial positive impact of the event (Kyriazopoulos and Drymbetas, 2015). Consequently, lower or no abnormal returns would be observed in the long run. No specific prediction is made by the economic disturbance theory (Gort, 1969). Hypothesis H2: There is a significant positive or no effect of acquisition announcement on abnormal returns of the acquiring firm in the long term. The paper follows positivist research philosophy in exploring the value-creating potential of M&A. The philosophy focuses on facts and observed data which is especially appropriate for objectively investigating market performance (Saunders et al., 2016). The use of deductive approach allows for constructing specific hypotheses based on existing theoretical frameworks. In addition, theoretical perspectives provide justification for the choice of the measure of corporate value and its estimation. This includes the operationalisation of value as market performance and the use of the market model for calculating abnormal returns. The study employs event study and quantitative research design to test formulated hypotheses using statistical methods. A sample of top 30 M&A in the UK is used to examine the hypotheses. The acquisition deals are limited to the years 2013-2015. This allows for minimising the potential impact of the global financial crisis on stock movements, as it has been argued to affect the M&A decision-making (Beltratti and Paladino, 2013). In addition, limiting the analysis to years 2013-2015 allows for estimating long-term performance for up to two years. Similar approach of focusing on smaller periods has been used in other empirical studies investigating the role of M&A (Ahn et al., 2010; Croci, 2007). However, this may limit the potential for generalisation of the findings. This is partially offset by the sample size as the exploration of a specific event or industry would provide a limited view on the M&A value creation. The acquisition deals included in the sample are required to be completed and involve publicly traded acquirer. This ensures that the relevant accounting and stock price information is available for the analysis. In addition, the market data on share prices should be available for at least a year before and two years after the acquisition announcement date. The data on the stocks as well as the FTSE100 Index is retrieved from Thompson One Banker (2017). As the study focuses on the value-creating potential of acquisition deals, it becomes important to use appropriate measures for value. Both short-term and long-term effects are investigated by considering the impact of the M&A announcement on CARs and BHARs. CARs have been commonly used in event studies to examine the impact of corporate news in the short run (Tuch and O'Sullivan, 2007; Haleblian et al., 2009). BHARs constitute a complementing measure that is more appropriate for quantifying long-term value creation (Bouwman et al., 2007). To improve the validity of the analysis, the deviation of CARs from zero is tested for several symmetric and asymmetric event windows. 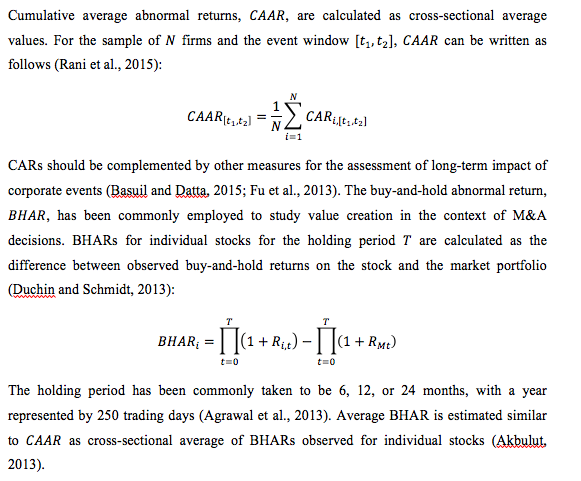 Likewise, different holding periods are used to calculate BHARs. Furthermore, two periods are used to estimate the market model to assess the robustness of the results. Cross-sectional average abnormal returns are examined by performing parametric and non-parametric tests. However, the event study design is known to be subject to several limitations (Dikova and Sahib, 2013). Most notably, the results may be strongly influenced by the choice of the event window length. In particular, narrow event windows might not be able to capture the effect of information leaked prior to the announcement. At the same time, a wider period could cover the impact of corporate news that are not directly linked to the acquisition deal. This could be especially relevant for the analysis of BHARs as holding periods of several years are likely to capture major industry-level and firm-specific events (Latorre et al., 2014). The length of the event windows should capture the potential impact of insider information and short-term effect of the announcement, but at the same time it should minimise the influence of other news (Wu et al., 2016). Similar empirical studies have commonly used event windows of 3, 11, and 21 days (Latorre et al., 2014; Agrawal et al., 2013). In addition, asymmetric event windows could be useful for representing the effect of leaked information (Rani et al., 2014). The characteristics of the sample are first assessed by considering cross-sectional summary statistics of abnormal returns for different event windows. The statistics are presented in Table 1 for the estimation period of 1 year. Mean CARs are positive for all symmetric and asymmetric event windows. This shows that, on average, announcements are associated with positive abnormal returns in the short-term. However, median values for the smallest window as well as both asymmetric intervals are negative. This may suggest that the distribution of CARs is positively skewed, with the longer right tail leading to a higher mean return. Indeed, the skewness is positive for four event windows, indicating that negative returns are frequent but are not extremely large. This is also mirrored in the minimum and maximum values of CARs. The largest returns tend to be greater than the absolute value of lowest CARs for all examined event windows. The discrepancy is more noticeable for the long-term returns. The distribution of BHARs is negatively skewed for all post-estimation windows, implying that a few extreme negative returns are present. This is in line with the minimum values being relatively larger compared to maximums for all three intervals. In general, longer post-estimation windows are associated with lower BHARs. More specifically, mean negative returns are estimated for the 12-month and 24-month intervals, and negative median is observed for the 24-month window. The short-term impact of the M&A announcement is studied by performing several cross-sectional tests on CARs. The basic cross-sectional test is used to assess the general effect of the event. The skewness-corrected test is employed to ensure that the deviation from normality does not affect the validity of the results. Similarly, the standardised Patell test accounts for the potential heteroscedasticity of the abnormal returns during the event window. The generalised sign test is performed to complement parametric methods with a test that does not rely on the choice of the underlying distribution. In general, no support is found for the announcements affecting short-term stock performance, implying that M&A might not be creating value for the acquirers. The results of the cross-sectional test are summarised in Table 2. The test shows no substantial evidence against the null hypothesis of the CARs being equal to zero. More specifically, the test statistics are found to be statistically insignificant at the conventional levels for all event windows. Put differently, the data does not support the alternative hypothesis of the non-zero effect of M&A announcements on stocks’ returns. This is consistent with the descriptive analysis that revealed that average abnormal returns were close to zero. The highest average CARs were associated with the [-5, 5] window which might be able to capture the impact of insider information while still being sufficiently narrow for representing the event. This is mirrored in the largest t-statistic being found for the [-5, 5] interval, although it is not significant even at the 0.10 level. The results are similar across different estimation periods. The statistics are not significant at the conventional levels, implying that the null hypothesis of zero CARs cannot be rejected for any event window. The t-statistic values are slightly lower for the 2-year estimation period which corresponds to lower average CARs compared to the 1-year estimation. This suggests that the test results are robust to the change of the estimation period as well as the event window. In particular, no evidence of the short-term impact of the announcement is found for all symmetric intervals. The results do not provide support for the hypothesis H1. Next, the skewness-corrected test is performed. The output is shown in Table 3. The results are similar to the cross-sectional test. Specifically, test statistics are not statistically significant at conventional levels. In other words, the null hypothesis of the CARs being equal to zero cannot be rejected. Thus, the test suggests that the data does not provide evidence for the impact of the M&A announcement on short-term market performance. The result is robust across different event windows, with the greatest test statistic corresponding to the [-5, 5] window. This reflects the interval being associated with the highest average cross-sectional CARs. However, skewness does not appear to have a substantial effect on return estimation. The output across different estimation periods is also similar. Therefore, the failure to reject the null hypothesis of zero CARs seems to be robust to changes to the market model estimates. The lack of discrepancy between the cross-sectional and skewness-corrected test may be attributed to the length of the examined event windows. In particular, 11-day and 3-day windows might be too narrow for the return skew to have an observable effect. Nevertheless, the results show no support for the alternative hypothesis of non-zero abnormal returns. Most importantly, the test further reinforces the perspective on the M&As not creating value. The results do not provide support for the hypothesis H1. The results of performing the cross-sectional standardised test for CARs are shown in Table 4. The output is in line with previous tests. To be more precise, none of the event windows seem to be associated with non-zero CARs as all test-statistics are found to be not significant at conventional levels. In particular, the results suggest that the null hypothesis of zero CARs cannot be rejected for both [-10,0] and [0, 10] event windows. This is notable since it may show that the potential heteroskedasticity due to the insider information does not appear to have a noticeable effect. Consequently, the alternative hypothesis of non-zero CARs cannot be accepted, which further supports the perspective of M&As not creating value. The results are robust to changes to the estimation window, as both 1-year and 2-year periods show no evidence against the null hypothesis. Thus, the findings for all parametric tests are consistent and strongly indicate no substantial short-term impact of the event. The failure to reject the null hypothesis for different estimation periods and event windows provides no support for the effect of M&A announcements on short-term market performance. Put differently, the market does not appear to have an unambiguous perspective on acquisitions as stock returns seem to be unaffected by the announcement. The results do not provide support for the hypothesis H1. The results are complemented by performing a non-parametric test which does not make assumptions on the underlying return distribution. Table 5 presents the key information on the test statistics. The output of the test does not show any substantial discrepancy from the expected number of stocks with positive CARs. In the context of the sample size of 30, the largest positive deviation is found for the [-10, 10] window with the 1-year estimation period and [-5, 5] window with the 2-year estimation period. Nevertheless, none of the test statistics are significant at conventional levels. This shows that the relative number of stocks with positive returns is in line with the expected value. The null hypothesis cannot be rejected for any event window, implying that CARs do not tend to be positive or negative in an unambiguous way. The results of the sign test are robust to changes to the estimation period and are consistent with findings obtained from the parametric tests. Overall, the empirical evidence provides no support against the null hypothesis of zero CARs for the five examined event windows. Consequently, the data does not appear to be in line with the M&A having a substantial effect on stocks’ market performance in the short run. In particular, the market might not view acquisitions as value-creating, which would be consistent with the absence of any significant influence of announcement events on CARs. The results do not provide support for the hypothesis H1. The analysis of long-term performance is based on two tests regarding BHARs with different estimation periods and event windows. The use of the cross-sectional and skewness-corrected tests would allow for assessing the general impact of announcements and accounting for the long-term returns being noticeably skewed. Overall, the results provide some evidence against the null-hypothesis of zero abnormal returns and suggest that M&A may destroy value in the long run. The results for the cross-sectional BHAR test are more ambiguous compared to the corresponding CAR test. They are presented in Table 6. The test statistics are not significant at conventional levels for both 6-month and 12-month post-estimation periods. Thus, no effect on market performance is observable for shorter holding periods. In contrast, the 24-month value is significant at the 0.10 and 0.01 levels for the 1-year and 2-year estimation periods, respectively. The result suggests that the null hypothesis of zero BHARs should be rejected. In other words, the announcement event appears to have a substantial influence on stock performance in the long run. This provides some evidence in support of the role of M&A, although the effect appears to be negative. Indeed, the descriptive analysis revealed that BHARs tended to be negative for longer holding periods, strongly indicating that M&As might be value-destructing for the acquirer. This influence does not appear to be observable for shorter periods, which is consistent with the analysis of CARs. At the same time, longer holding periods are more likely to capture significant news, which are not directly related to the acquisition. Nevertheless, the findings show that stocks tend to perform poorly in the post-acquisition period. The results do not provide support for the hypothesis H2. 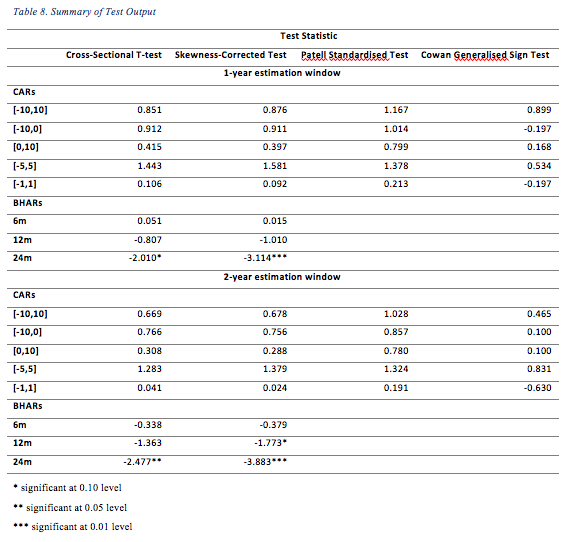 Similar results are obtained by performing the skewness-corrected version of the cross-sectional test (Table 7). The output mirrors the statistics estimated in the cross-sectional BHAR test. The shorter periods tend to exhibit no sign of the M&A impact, with both 6-month test statistics not being significant at conventional levels. Likewise, the 12-month holding period provides weak evidence of the M&A influence, as only the 2-year estimation period is associated with an effect significant at the 0.10 level. Stronger support against the null hypothesis of zero BHARs is found for the longest holding period of 24 months. Both test statistics are significant at the 0.01 level, indicating that there exists a relationship between M&A and abnormal returns in the long run. All significant effects are negative, which reflects the findings of the descriptive analysis on the cross-sectional average BHARs. The result is consistent with the basic cross-sectional test and implies that abnormal returns tend to be negative in the long run even after accounting for the potential non-zero skewness. This provides stronger evidence for the effect of M&A on acquirers’ long-term market performance. More specifically, the findings suggest that acquisitions destroy rather than create value. Alternatively, the holding periods employed in the analysis might be too narrow to capture the positive effect of the realised synergy between the acquirer and the target. The results do not provide support for the hypothesis H2. The analysis does not provide unambiguous evidence supporting a particular effect of M&A on stock performance. Nevertheless, the results of the CAR analysis appear to be consistent across different event windows and estimation periods and show no sign of the announcement impact in the short run. At the same time, BHARs tend to be negative for longer holding periods while no effect is found for shorter periods. The results of all performed tests are summarised in Table 8. It can be seen that none of the test statistics are statistically significant in the case of CARs. Thus, the null hypothesis of zero CARs cannot be rejected, reflecting the market not having a consistent perspective on the role of the M&A across different stocks. This result is robust to changes in the estimating period and event window length, providing unambiguous evidence against the value-creating view of M&A. The BHAR analysis shows some support for the role of M&A in the long run. Most notably, abnormal returns for longer holding periods appear to significantly deviate from zero. However, the effect is consistently negative, implying that the M&A decision could be value-destructing. Although the results across different holding periods are more ambiguous, they are consistent in providing no evidence for the positive role of M&A in the long term. Overall, the findings indicate that acquisitions are not associated with superior market performance. This remains true for measures of both short-term and long-term performance. Furthermore, this result is consistent across different event windows, holding periods, and market model estimation periods. Therefore, it can be argued that M&A do not create value for the acquirer. The findings contradict the hypothesis H1 as no positive impact in the short-term is observed. The results are also inconsistent with the hypothesis H2 since significant negative BHARs were found for longer holding periods. Both hypothesis should be rejected based on the existing evidence. The aim of the present paper was to assess whether M&A create value for the acquiring firms. 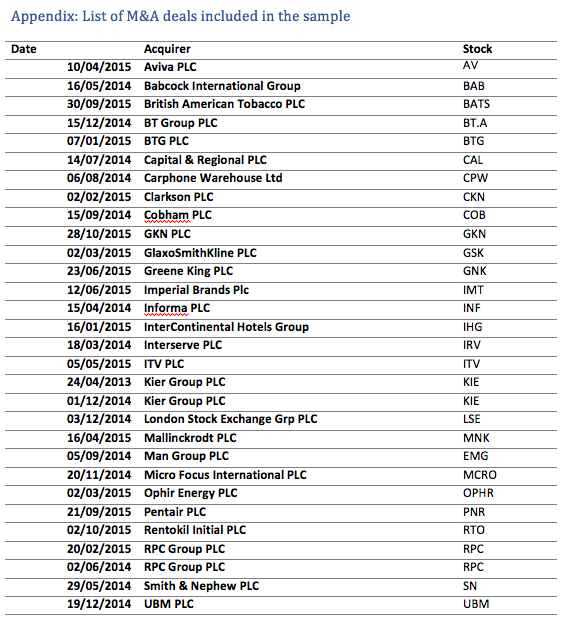 A sample of 30 largest UK M&A deals for the 2013-2015 period was investigated. Both short-term and long-term effects were explored by estimating CARs and BHARs for different event windows and holding periods. The results provide mixed evidence regarding a specific effect of M&A. The CARs were observed to be statistically indistinguishable from zero. This does not support the hypothesis H1 which suggested that a positive effect should be found. At the same time, a negative impact of acquisitions on the long-term stock performance was observed for the 24-month BHARs. This provides no support for the hypothesis H2 which claimed that no or positive impact should be observed in the long run. The results are consistent in providing evidence against the value-creating perspective on M&A. This is in line with the existing empirical literature. The analysis of the short-term effect of M&A used CARs as the measure of market performance. The results showed no relationship between abnormal returns and M&A announcements. The findings were consistent across different event windows and estimation periods for the market model. The hypothesis H1 was rejected based on the evidence. The results agree with theoretical frameworks which predicted no or negative effect of M&As in the short run such as the agency theory (Morck et al., 1990; Zhu and Zhu, 2016), the hubris theory (Roll, 1986), and the envy-based preference hypothesis (Goel and Thakor, 2010). The findings are in line with the existing empirical evidence suggesting that no positive impact of M&A on CARs should be observed (Ishii and Xuan, 2014; Golubov et al., 2012; Tuch and O'Sullivan, 2007; Haleblian et al., 2009). The potential long-term impact of M&A was studied by estimating BHARs for different holding periods. The results were mixed regarding the exact effect of M&A deals. No impact was found for shorter holding periods while negative influence was observed for longer periods. The findings suggest that M&A deals have no positive effect on stock performance in the long run. The hypothesis H2 was rejected based on the evidence. The results were explained in the context of the agency theory and behavioural frameworks (Morck et al., 1990). In particular, the hubris theory (Roll, 1986) and envious manager hypothesis (Goel and Thakor, 2010) could be applied to show that M&A might lead to poor performance during longer holding periods. The overconfidence of the managers and their envy-based preferences would provide additional incentives for undertaking value-destroying M&A deals. The findings are consistent with the existing empirical evidence suggesting that no positive impact of M&A on long-term abnormal returns should be found (Rahman et al., 2016; Yaghoubi et al., 2014; Bouwman et al., 2007; Croci, 2007). The study is subject to several limitations. The event study design has been noted to have several limitations (Dikova and Sahib, 2013). The significance of the results may be strongly affected by the choice of the event window. On the one hand, a narrower event window might not be able to capture the effect of information leaked prior to the announcement. On the other hand, it is more likely for a wider period to include effects of corporate news that are not directly linked to the examined M&A. It could be especially challenging to distinguish between M&A effects and other industry-level and firm-specific events for the longer holding periods of BHARs (Latorre et al., 2014). In addition, the sample selection might not allow for generalisation to the M&A market outside of the UK. Furthermore, the focus on the 2013-2015 years might limit the applicability of the findings even within the country. Likewise, the criterion of largest M&A deals implies that the value-creating potential of smaller acquisitions may noticeably differ. The use of the market model might also be less appropriate for the firms that are poorly explained by the FTSE100 Index. Future studies may expand on the present paper to further investigate the role of M&As in smaller UK firms. This could be especially useful in the context of the merger anticipation hypothesis (Gorton et al., 2009) which predicts that only smaller companies would create value in the long run. Therefore, the research could be extended to include smaller M&A deals. The examined period could be widened to include the potential effect of the global financial crisis. While this might affect the estimation of the abnormal returns (Beltratti and Paladino, 2013), this would also allow for greater sample size which would further improve the validity of the analysis. As the focus on the UK acquirers may limit the generalisability of the findings, both developed and developing countries could be explored to identify key similarities in how M&A may create or destroy value. Furthermore, the traditional use of abnormal returns could be complemented by considering dollar abnormal returns similar to Fich et al. (2016). It was argued that an estimate of the net present value could be useful for large acquiring firms, since even statistically small returns could translate into great changes in wealth. Agrawal, A. and Jaffe, J. F. (2000). The post-merger performance puzzle. In Finkelstein, S. and Cooper, C. Eds. Advances in mergers and acquisitions. Bingley: Emerald Group Publishing Limited, pp.7-41. Agrawal, A., and Walkling, R. A. (1994). Executive careers and compensation surrounding takeover bids. The Journal of Finance, 49(3), pp.985-1014. Agrawal, A., Cooper, T., Lian, Q. and Wang, Q. (2013). Common advisors in mergers and acquisitions: Determinants and consequences. Journal of Law and Economics, 56, pp.691–740. Ahn, S., Jiraporn, P., and Kim, Y. S. (2010). Multiple directorships and acquirer returns. Journal of Banking & Finance, 34(9), pp.2011-2026. Akbulut, M. E. (2013). Do overvaluation-driven stock acquisitions really benefit acquirer shareholders? Journal of Financial and Quantitative Analysis, 48(4), pp.1025-1055. Aktas, N., De Bodt, E. and Roll, R. (2013). Learning from repetitive acquisitions: Evidence from the time between deals. Journal of Financial Economics, 108(1), pp.99-117. Antoniou, A., Petmezas, D., and Zhao, H. (2007). Bidder gains and losses of firms involved in many acquisitions. Journal of Business Finance & Accounting, 34(7‐8), pp.1221-1244. Aw, M. S. B., and Chatterjee, R. A. (2004). The performance of UK firms acquiring large cross-border and domestic takeover targets. Applied Financial Economics, 14(5), pp.337-349. Basuil, D. A. and Datta, D. K. (2015). Effects of Industry‐and Region‐Specific Acquisition Experience on Value Creation in Cross‐Border Acquisitions: The Moderating Role of Cultural Similarity. Journal of Management Studies, 52(6), pp.766-795. Bessembinder, H. and Zhang, F. (2013). Firm characteristics and long-run stock returns after corporate events. Journal of Financial Economics, 109(1), pp.83-102. Bhagat, S., Dong, M., Hirshleifer, D., and Noah, R. (2005). Do tender offers create value? New methods and evidence. Journal of Financial Economics, 76(1), 3-60. Bouwman, C. H., Fuller, K., and Nain, A. S. (2007). Market valuation and acquisition quality: Empirical evidence. The Review of Financial Studies, 22(2), pp.633-679. Brown, S. J., and Warner, J. B. (1980). Measuring security price performance. Journal of financial economics, 8(3), pp.205-258. Cai, Y., Kim, Y., Park, J. C. and White, H. D. (2016). Common auditors in M&A transactions. Journal of Accounting and Economics, 61(1), pp.77-99. Campbell, C. J., and Wesley, C. E. (1993). Measuring security price performance using daily NASDAQ returns. Journal of Financial Economics, 33(1), pp.73-92. Cartwright, S. and Schoenberg, R. (2006). Thirty years of mergers and acquisitions research: Recent advances and future opportunities. British Journal of Management, 17(S1), pp.S1-S5. Conn, R. L., Cosh, A., Guest, P. M., and Hughes, A. (2005). The impact on UK acquirers of domestic, cross‐border, public and private acquisitions. Journal of Business Finance & Accounting, 32(5‐6), pp.815-870. Cowan, A. R. (1992). Nonparametric event study tests. Review of Quantitative Finance and Accounting, 2(4), pp.343-358. Croci, E. (2007). Corporate raiders, performance and governance in Europe. European Financial Management, 13(5), pp.949-978. Cuypers, I. R., Cuypers, Y., and Martin, X. (2017). When the target may know better: Effects of experience and information asymmetries on value from mergers and acquisitions. Strategic Management Journal, 38(3), pp.609-625. Datta, D. K., Pinches, G. E., and Narayanan, V. K. (1992). Factors influencing wealth creation from mergers and acquisitions: A meta‐analysis. Strategic management journal, 13(1), pp.67-84. Deng, X., Kang, J. K. and Low, B. S. (2013). Corporate social responsibility and stakeholder value maximization: Evidence from mergers. Journal of Financial Economics, 110(1), pp.87-109. Dikova, D. and Sahib, P. R. (2013). Is cultural distance a bane or a boon for cross-border acquisition performance? Journal of World Business, 48(1), pp.77-86. Duchin, R. and Schmidt, B. (2013). Riding the merger wave: Uncertainty, reduced monitoring, and bad acquisitions. Journal of Financial Economics, 107(1), pp.69-88. Fama, E. F. (1965). The behaviour of stock market prices. Journal of Business, 38, pp.34–105. Fama, E. F. (1970). Efficient capital markets: A review of theory and empirical work. The Journal of Finance, 25(2), pp.383-417. Fich, E. M., Nguyen, T., and Officer, M. S. (2016). Large wealth creation in mergers and acquisitions. [online] Available at: http://dx.doi.org/10.2139/ssrn.2020507 [Accessed Nov 18 2017]. Fu, F., Lin, L. and Officer, M. S. (2013). Acquisitions driven by stock overvaluation: Are they good deals? Journal of Financial Economics, 109(1), pp.24-39. Goel, A. M., and Thakor, A. V. (2010). Do envious CEOs cause merger waves? The Review of Financial Studies, 23(2), pp.487-517. Golubov, A., Petmezas, D., and Travlos, N. G. (2012). When it pays to pay your investment banker: New evidence on the role of financial advisors in M&As. The Journal of Finance, 67(1), pp.271-311. Gomez-Mejia, L., and Wiseman, R. M. (1997). Reframing execufive compensation: An assessment and outlook. Journal of Management, 23(3), pp.291-374. Gort, M. (1969). An economic disturbance theory of mergers. The Quarterly Journal of Economics, 83(4), pp.624-642. Gorton, G., Kahl, M., and Rosen, R. J. (2009). Eat or be eaten: A theory of mergers and firm size. The Journal of Finance, 64(3), pp.1291-1344. Gregory, A., and McCorriston, S. (2005). Foreign acquisitions by UK limited companies: short-and long-run performance. Journal of Empirical Finance, 12(1), pp.99-125. Haleblian, J., Devers, C. E., McNamara, G., Carpenter, M. A., and Davison, R. B. (2009). Taking stock of what we know about mergers and acquisitions: A review and research agenda. Journal of Management, 35(3), pp.469-502. Hall, P. (1992). On the removal of skewness by transformation. Journal of the Royal Statistical Society, 54(1), pp.221-228. Harford, J., and Li, K. (2007). Decoupling CEO wealth and firm performance: The case of acquiring CEOs. The Journal of Finance, 62(2), pp.917-949. Harford, J., and Schonlau, R. J. (2013). Does the director labor market offer ex post settling-up for CEOs? The case of acquisitions. Journal of Financial Economics, 110(1), pp.18-36. Hayward, M. L., and Hambrick, D. C. (1997). Explaining the premiums paid for large acquisitions: Evidence of CEO hubris. Administrative Science Quarterly, 42(1), pp.103-127. Ishii, J., and Xuan, Y. (2014). Acquirer-target social ties and merger outcomes. Journal of Financial Economics, 112(3), pp.344-363. Jakobsen, J., and Voetmann, T. (2003). Post-acquisition performance in the short and long run. Evidence from the Copenhagen Stock Exchange 1993–1997. The European Journal of Finance, 9(4), pp.323-342. Jensen, M. C. and Ruback, R. S. (1983). The market for corporate control: The scientific evidence. Journal of Financial Economics, 11(1-4), pp.5-50. Johnson, N. J. (1978). Modified t tests and confidence intervals for asymmetrical populations. Journal of the American Statistical Association, 73(363), pp.536-544. Jovanovic, B., and Rousseau, P. L. (2008). Mergers as reallocation. The Review of Economics and Statistics, 90(4), pp.765-776. Kahneman, D. (2003). Maps of bounded rationality. American Economic Review, 93(5), pp.1449–1475. Kahneman, D., and Tversky, A. (1979). Prospect theory: An analysis of decision under risk. Econometrica, 47(2), pp.263–291. Karampatsas, N., Petmezas, D. and Travlos, N. G. (2014). Credit ratings and the choice of payment method in mergers and acquisitions. Journal of Corporate Finance, 25, pp.474-493. King, D. R., Dalton, D. R., Daily, C. M., and Covin, J. G. (2004). Meta‐analyses of post‐acquisition performance: Indications of unidentified moderators. Strategic Management Journal, 25(2), pp.187-200. Kyriazopoulos, G. and Drymbetas, E. (2015). Do domestic banks Mergers and Acquisitions Still Create Value? Recent Evidence from Europe. Journal of Finance, 3(1), pp.100-116. Lamba, A. and Tripathi, V. (2015). Long Run Value Creation from Cross Border Mergers and Acquisitions: Evidence from Indian Acquirer Companies. The International Journal of Business & Management, 3(3), pp.161-166. Latorre, M. A., Herrero, B. and Farinós, J. E. (2014). Do acquirers’ stock prices fully react to the acquisition announcement of listed versus unlisted target firms? Out-of-sample evidence from Spain. Applied Economics Letters, 21(15), pp.1075-1078. Malmendier, U., and Tate, G. (2008). Who makes acquisitions? CEO overconfidence and the market's reaction. Journal of financial Economics, 89(1), pp.20-43. McNichols, M. F. and Stubben, S. R. (2015). The effect of target-firm accounting quality on valuation in acquisitions. Review of Accounting Studies, 20(1), pp.110-140. Mitchell, M. L., and Mulherin, J. H. (1996). The impact of industry shocks on takeover and restructuring activity. Journal of financial economics, 41(2), pp.193-229. Morck, R., Shleifer, A., and Vishny, R. W. (1990). Do managerial objectives drive bad acquisitions?. The Journal of Finance, 45(1), pp.31-48. NASDAQ. (2017). Mallinckrodt (MNK) Down 55% Year to Date: What Lies Ahead? [online] Available at: http://www.nasdaq.com/article/mallinckrodt-mnk-down-55-year-to-date-what-lies-ahead-cm880396 [Accessed 18 Nov 2017]. Patell, J. M. (1976). Corporate forecasts of earnings per share and stock price behavior: Empirical test. Journal of accounting research, pp.246-276. Pfeffer, J. (1972). Merger as a response to organizational interdependence. Administrative Science Quarterly, 17(3), pp.382-394. Rahman, M. A., Shien, L. K., and Sadique, M. S. (2013). Swings in sentiment and stock returns: Evidence from a frontier market. International Journal of Trade, Economics and Finance, 4(6), pp.347-352. Rahman, M., Lambkin, M., and Hussain, D. (2016). Value creation and appropriation following M&A: A data envelopment analysis. Journal of Business Research, 69(12), pp.5628-5635. Raissi, N., and Missaoui, S. (2015). Role of investor sentiment in financial markets: an explanation by behavioural finance approach. International Journal of Accounting and Finance, 5(4), pp.362-401. Rani, N., Yadav, S. S. and Jain, P. K. (2015). Impact of Mergers and Acquisitions on Shareholders’ Wealth in the Short Run: An Event Study Approach. Vikalpa, 40(3), pp.293-306. Reuer, J. J., Tong, T. W., Tyler, B. B. and Ariño, A. (2013). Executive preferences for governance modes and exchange partners: An information economics perspective. Strategic Management Journal, 34(9), pp.1104-1122. Rhodes–Kropf, M., Robinson, D. T., and Viswanathan, S. (2005). Valuation waves and merger activity: The empirical evidence. Journal of Financial Economics, 77(3), pp.561-603. Roll, R. (1986). The Hubris Hypothesis of Corporate Takeovers. Journal of Business, 59(2), pp.197-216. Rosen, R. J. (2006). Merger momentum and investor sentiment: The stock market reaction to merger announcements. The Journal of Business, 79(2), pp.987-1017. Saunders, M., Lewis, P., and Thornhill, A. (2016). Research Methods for Business Students. Harlow: Pearson Education. Servaes, H. (1991). Tobin's Q and the Gains from Takeovers. The Journal of Finance, 46(1), pp.409-419. Seth, A. (1990). Value creation in acquisitions: A re‐examination of performance issues. Strategic Management Journal, 11(2), pp.99-115. Shiller, R. J. (1981). The use of volatility measures in assessing market efficiency. The Journal of Finance, 36(2), pp.291-304. Shleifer, A., and Vishny, R. W. (1986). Large shareholders and corporate control. Journal of political economy, 94(3, Part 1), pp.461-488. Thomson ONE Banker. (2017). Thomson ONE Banker Database. [online] Available at: http://banker.thomsonib.com/ [Accessed 18 Nov 2017]. Toxvaerd, F. (2008). Strategic merger waves: A theory of musical chairs. Journal of Economic Theory, 140(1), pp.1-26. Trading.Co UK. (2017). Mallinckrodt Down as District Court Invalidates Inomax Patents [online] Available at: https://trading.co.uk/story/c242d086-7afd-4571-aebb-006fc40273f2/ [Accessed 18 Nov 2017]. Trichterborn, A., Knyphausen‐Aufseß, Z. and Schweizer, L. (2016). How to improve acquisition performance: The role of a dedicated M&A function, M&A learning process, and M&A capability. Strategic Management Journal, 37(4), pp.763-773. Tuch, C., and O'Sullivan, N. (2007). The impact of acquisitions on firm performance: A review of the evidence. International Journal of Management Reviews, 9(2), pp.141-170. Tuyon, J., and Ahmad, Z. (2014). Psychoanalysis of Investor Irrationality and Dynamism in Stock Market. Journal of Interdisciplinary Economics, 29(2), pp.1-38. Wang, W., and Whyte, A. M. (2010). Managerial rights, use of investment banks, and the wealth effects for acquiring firms’ shareholders. Journal of Banking & Finance, 34(1), pp.44-54. Watson, D., and Tellegen, A. (1985). Toward a consensual structure of mood. Psychological bulletin, 98(2), pp.219–235. Wu, X., Yang, X., Yang, H. and Lei, H. (2016). Cross-Border Mergers and Acquisitions by Chinese Firms: value creation or value destruction? Journal of Contemporary China, 25(97), pp.130-145. Xie, Y., Yi, H. S. and Zhang, Y. (2013). The value of Big N target auditors in corporate takeovers. Auditing: A Journal of Practice and Theory, 32(3), pp.141-169. Yaghoubi, R., Locke, S., and Gibb, J. (2014). Acquisition returns: does industry matter? Studies in Economics and Finance, 31(3), pp.309-324. Yaghoubi, R., Yaghoubi, M., Locke, S., and Gibb, J. (2016a). Mergers and acquisitions: a review. Part 1. Studies in Economics and Finance, 33(1), pp.147-188. Yaghoubi, R., Yaghoubi, M., Locke, S., and Gibb, J. (2016b). Mergers and acquisitions: a review (part 2). Studies in Economics and Finance, 33(3), pp.437-464. Zhu, D. H., and Chen, G. (2015). CEO narcissism and the impact of prior board experience on corporate strategy. Administrative Science Quarterly, 60(1), pp.31-65. Zhu, H., and Zhu, Q. (2016). Mergers and acquisitions by Chinese firms: A review and comparison with other mergers and acquisitions research in the leading journals. Asia Pacific Journal of Management, 33(4), pp.1107-1149.